There’s no question, the market has been experiencing quite a ride since the start of the New Year. Some economists estimate as much as $1 trillion has been lost due to market volatility in 2016. This bull market is currently being challenged by fears of recession, leaving many investors asking whether we are headed into a bear market (defined by a 20% drop). With memories of 2008 looming for many investors, it’s human nature to want to avoid the same mistake twice. However, it is important to remain calm – especially if you are a U.S investor. The U.S. market hit an all-time high in May 2015 and, despite all the turmoil since then, the market is only about 10% lower; nowhere near the 20% that defines a bear market. While the probability of a recession has risen, we are confident that the U.S. will avoid a bear market. In fact, we believe that the U.S. economy will not only withstand this global turmoil, it may keep growing until at least 2020. Consumer confidence is holding up, emphasizing the contrast between Wall Street and Main Street. Therefore, we recommend investors continue to consider U.S. equities as part of a diverse portfolio. It’s also a good time to consider rebalancing your portfolio. Bond returns are broadly positive year to date. Investors with a shorter time horizon, or wishing to be tactical or opportunistic, may want to sell into rallies to raise cash. However, historically, staying in the market has rewarded investors more than timing the market. The key is to remove emotion from investing and stick to your long-term goals. While global recession risks might have risen due to China’s slowing economy, falling energy prices and rising interest rates in United States, we strongly doubt that banks and U.S. financials in particular will again be the epicenter of the storm this time. The reality is, the market ebbs and flows. During this volatile time in the stock market, don’t panic. Instead, consult a professional to make sure you are making the right moves for your long-term financial success rather than making short-term decisions you may regret in the future. 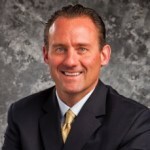 Todd Hauer is a Financial Advisor with the Global Wealth Management Division of Morgan Stanley in the Denver Tech Center. The information contained in this interview is not a solicitation to purchase or sell investments. Any information presented is general in nature and not intended to provide individually tailored investment advice. The strategies and/or investments referenced may not be suitable for all investors as the appropriateness of a particular investment or strategy will depend on an investor’s individual circumstances and objectives. Investing involves risks and there is always the potential of losing money when you invest. The views expressed herein are those of the author and may not necessarily reflect the views of Morgan Stanley Wealth Management, or its affiliates. Morgan Stanley Smith Barney, LLC, member SIPC.